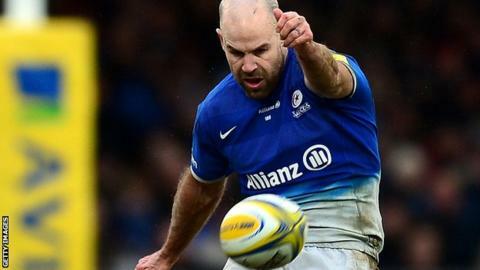 Saracens scored 14 straight points at second-placed Exeter to extend their lead at the top of the Premiership. Two Gareth Steenson penalties for Chiefs was added to when wing James Short intercepted Charlie Hodgson's pass to run 95 metres to score. But Samuela Vunisa crashed over from a driving maul to keep Sarries in touch at 11-5 at the break. In tricky, windy conditions at Sandy Park, Hodgson added three second-half penalties to secure the four points. It means Saracens go five points clear of Exeter at the top of the league and have now lost just once in their last 20 games in all competitions. Rob Baxter's side, who did the double over Saracens last season, were ahead by 11 points after 29 minutes in front of a sold-out crowd, as they controlled the opening exchanges with the wind behind them. However Vunisa, in for England number eight Billy Vunipola, touched down his fourth try in four games and the Premiership's all-time leading scorer Hodgson knocked over all three of his second-half penalties to take the win. "If we had lost that one, I would have said it was one that got away as we had much the better of possession and territory but they defended very well. "We were 11-0 down playing against the strong wind but we didn't deserve to be and Vunisa's try just before the interval was crucial as we went into half-time only six points down. "It doesn't get any easier as we have Wasps next week and they have less players away to international calls than we do, but I have confidence in this group of players for the next few weeks." "The result is not the be all and end all as we are still second in the Premiership and overall our performance was pretty good as we just lost a game, late in the day against a very good side. "It was a tough game and a very close one but I'm slightly frustrated with certain aspects of our game. "Our ill-discipline just before half-time gave them a try and it was a huge moment in the match, so we have to be a little bit better." Replacements: Cowan-Dickie, Hepburn, Williams, Stevenson, Horstmann, Lewis, Hooley, Bodilly. Replacements: Saunders, Gill, Lamositele, Itoje, Burger, Spencer, Mordt, Earle.